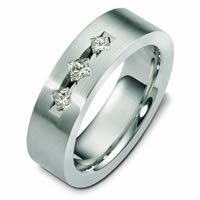 Browse a large collection of wedding rings in yellow and white gold. See our selection of 18 karat contemporary wedding rings with modern motifs. 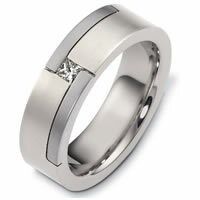 Desirable platinum modern wedding rings with fresh styles. A selection of contemporary wedding rings made with contemporary metals. The best and brightest designers reconstruct traditional wedding band designs to create modern day looks for our contemporary wedding bands. They use the finest precious metals and only the highest quality gemstones and diamonds to create these modern wedding bands to order. 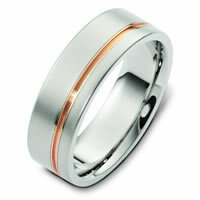 Our contemporary wedding bands come in a multitude of materials and metals. We push past traditional precious metals of gold, platinum, and silver, incorporating tungsten, titanium, and other material to create a look that is fashionably forward. 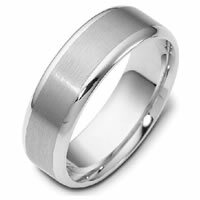 Wedding Bands high degree of artistic acumen for exacting and original design is reflected in its fabulous new line of contemporary wedding bands. Our contemporary women and men's wedding bands with modern overtones and precise refinement attests to the crowning achievement of the master jeweler's art. 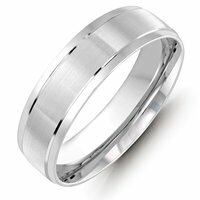 A few simple principles guide all our wedding bands: Provide many design choices made from the finest quality materials, and offer them at a reasonable price. Any of these styles are sure to turn heads and garner compliments, so discover a ring uniquely yours today.